Russian-U.S. artist Victor Bregeda was born in 1963 in the city of Taganrog into a family of painters. The artist states that he has been painting since he can first remember himself. After completing his art studies at an art university in Moscow, Bregeda made a decision to go along with his own personal comprehension of what creative art was really all about. This was in direct contrast to the strict rules of the teaching he had received. He was particularly attracted by the smooth painting espouced by the Dutch school of painting. Those artists who inspired him the most were Leonardo Da Vinci, Hieronymus Bosch, Peter Bruegel, Max Ernst, Nikolai Rerikh, and he states, "I also like the French school of the 18th - 19th centuries...and in addition, the works of Andrew Wyeth. My artistic abilities are in my blood, thanks to my forefathers, and I grew up in a strong creative environment. 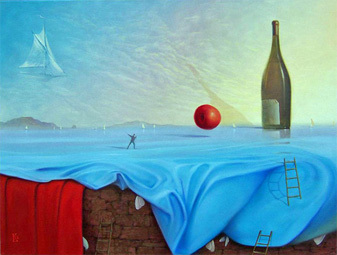 Bregeda's key directions are working with Plein Aire Landscapes, still lifes and portraits, performed in a metarealistic sytle with a strong influence of subconscious philosophy. The artist is using a mélange of techniques, materials and styles and tries to invent new ones. Victor's art is displayed in art galleries and museums nationwide and worldwide. In his works Victor Bregeda shows the real nature of things hidden from empirical understanding. "I base all of my artwork on observation or experimentation...not on theory." Christianity is a subject that has a special place in the art of Victor Bregeda. The best selling artwork, Eucharist, opened a series of paintings with Christian symbolism. Victor Bregeda used his surrealistic art to portray the image of Christ and the idea of Divine love out of the nature of things, a love that, with free will, chose to die to let us live. The paintings are interconnected by the same subject, composition and artistic method of transformation of images. The candle, being the symbol of light and Christian faith, transforms into the image of Christ and His disciples. The image of Jesus Christ can be easily seen in the flames of Eucharist, while the disciples, bowed in devotion before their teacher, can be seen in the outlines of the wax candle. Singers Stevie Nicks and Sheryl Crow, boxer Oscar De La Hoya have collected Bregeda as have actors Burt Reynolds, Connie Seleca, and John Tesh. Bregeda's artwork commands attention, it is both subtle and powerful. It is timeless, thought provoking, elevating in substance and flawlessly done. Visit www.bregeda.com for more information.